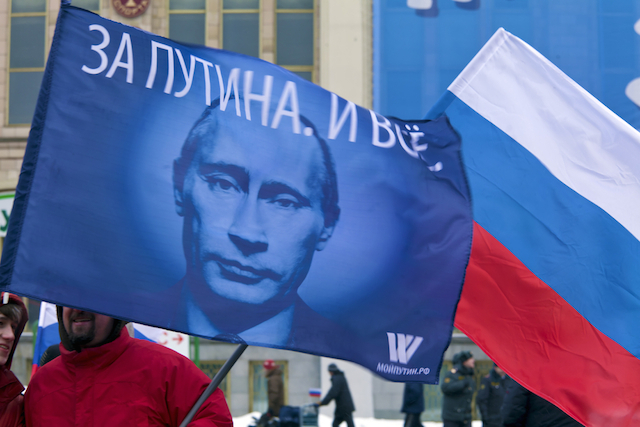 Russian propaganda is taking the EU off-guard. Some who still remember the Communist days say it is reaching heights unknown, since the end of the Cold War. Thirty years ago, this propaganda was on the defensive, while now Moscow is on the offensive, writes Georgi Gotev. Russia strongman Vladimir Putin thinks he is exacting revenge following the collapse of the Communist bloc, and of the Soviet Union. He has his geopolitical projects – the Eurasian Union, the Customs Union and the Novorossiya (New Russia) concept. Those are relatively recent creations, the scope of which is not always understood in EU circles. Russia’s state-controlled media are mobilised as in wartime not only to deliver messages, but often to spread rumours and create confusion. Exit information, enter disinformation. Its target is not only the Russian population, but Russian-speaking minorities in neighbouring countries, even in the EU (the Baltic countries) and the wider audiences of neighbouring countries with historic sympathies for Russia (Bulgaria). And, finally, they are also aimed at Western audiences which appear increasingly vulnerable to populism. Think RT (formerly Russia Today) and its increasingly popular video news provider, Ruptly. Russian messages are calibrated for local context. A clear example is the capacity of Moscow to mobilise public sentiment against shale gas (in Romania and Bulgaria), in favour of the South Stream gas pipeline project (in Hungary, Bulgaria, Serbia, Italy, Austria), against EU sanctions (in Italy, Slovakia, Hungary, Austria, Cyprus, Greece) or against the Ukrainian government, described by Moscow as “fascist” (in Bulgaria, Serbia). During the Cold War, the West had Radio Free Europe / Radio Liberty (RFE/RL), the foreign language services of Deutsche Welle, and some others. Although listening to them was prohibited, and their signal was jammed by Communist regimes, the messages were getting through, and a majority of people on the eastern side of the Iron Curtain believed the messages coming from the West. Today, even in some EU countries, media ownership is obscure, and media standards often low, while Russian money is abundant. Faced with such a challenge, what does EU communication do? Not much. I’m not aware of anyone measuring the damage done. I’m not saying that the EU should act in the same style as it did during the Cold War, or mirror what Russia is doing today. To the contrary, the right response is not political activism, it’s not choosing one camp over the other. In a conflict, usually both sides carry some of the blame. Common sense suggests that deepening the antagonisms would only cause harm to all sides. Common sense also suggests that the truth, and non-partisan reporting, can be a bridge between Europe and Russia. I once wrote in my blog that the “either-or” EU discourse (Ukraine having to choose between EU association and the Customs Union) was perceived in the Kremlin as a declaration of war. But the former European Commission didn’t seem to realise that. Former Commission President José Manuel Barroso advocated creating a “European public space”, but failed to notice that for years, EURACTIV has pioneered such a concept. Over time, EURACTIV has grown to be a media network in 12 countries, with 12 editorial teams reporting on EU-related issues in 10 member countries, not to mention Turkey and Serbia. We have championed balanced reporting, and the possibility for stakeholders to speak out. Long before anyone in the EU paid attention to Ukraine, EURACTIV covered in depth its complicated relations with Europe, as well as those of the countries of the Eastern Partnership (Ukraine, Moldova, Georgia, Belarus, Armenia, Azerbaijan). This was done not only from a Brussels perspective, but also from Paris, Berlin and Warsaw. When I was a journalist in my home country, Bulgaria, I was already using EURACTIV as a shortcut to EU-related news. Instead of going to the websites of EU institutions, often complicated and not always user-friendly, I went to EURACTIV, where I found the news plus the links to the official documents, from which I was cherry-picking what was relevant for my country. We profess fact-checking. We consult the official documents to avoid the caricatures of the original texts that can sometimes be made. We avoid stereotypes. If we keep setting a good example, others will follow. We have a new Commission and a new Parliament, with, in all likelihood, new ideas about EU communication. I hope they will read this text. Bad EU communication has been part of the problem. Better communication could be part of the solution.